Why do volunteers quit? Is it the lack of enthusiasm and commitment? Sometimes it is a poorly managed volunteering experience that leads to volunteers falling out. I have been a volunteer for as long as I can remember. Starting at nearly 5 years of age, when my parents used to take me to medical camps, to until recently, when I just finished a 2-year volunteering project with a Foundation in Angola, Africa working with street children. When I was in IIT, some of us had been interviewed for a documentary– “I am 20”– in 1967. I had then said, “Freedom in India means freedom to starve, go naked, be uneducated and die of hunger.” I was critical about the conditions in India and felt we had failed to achieve our goals. After graduation I set up an industry in plastic packaging. To me providing livelihoods was one of the key priorities, and at the end of the last century we employed 500 people. It is estimated that less than a hundredth of the world’s built space is designed by architects. As members of the community, this limited contribution has been the cause of some discontent to us. So, in 2013, when HSMI, the R&D cell of the Housing and Urban Development Corporation (HUDCO) accepted our proposal for a project aimed at exploring the affordable housing space, we were excited at what we saw as a precious opportunity to push the boundaries of our profession, to design for ‘the other 90 percent’ and to truly innovate. Over the past 10 years I have been working with BIOME Environmental, an organization that looks at ways to promote sustainable living in a city – not only in theory but also in practice. The practice comes from the solutions that the group of BIOME engineers and architects offer – homes designed to keep energy requirements low, homes made of sun-dried mud blocks, homes which store and reuse rainwater, homes that treat wastewater and allow it to be reused within the site itself, etc.. I am a part of the Water team within BIOME, and this allows me the opportunity to travel and look at various aspects of water – the issues and solutions – around Bangalore and across the country. The water sources that capture my imagination and that of my team– for their beauty, human ingenuity, history, adventure and poetry – are not the springs, rivers, dams and lakes, but simple manmade structures that provide access to water – shallow open wells. Our vision is to get children to play! As simple as that. But it took us 14 years and multiple business models to finally develop an idea that worked. The journey has not been easy. And it started in 2003. We were evaluating many start-up ideas. Nothing clicked. Until a friend shared the story of his son not playing enough and wished that there were more playgrounds. This thought sparked an idea; a business was conceived and a company named SportzVillage was formed in August 2003. “This is it” I told myself, “It’s time to take the leap of faith!” The consequences did not matter. All that mattered was that inner voice that desperately wanted me to take the plunge…and so I did. Suddenly, just like that, I resigned from my extremely promising corporate job and decided to pursue my passion– teaching. Chemistry is one of the fundamental subjects introduced in Secondary and Higher Secondary School curriculum. The traditional way of teaching chemistry involves theoretical and visual tools. The experimental kits available focus more on the observations or the effects which at times fail to address the fundamentals. Moreover, unfortunately, the course content in standard texts is not well connected. High school students consider chemistry as one of the dry subjects which requires lot of cramming and memorizing. A play-way approach works best not only to address the fundamentals but to make the subject more interesting. Use of innovative, cost effective tools like board and card games can make the subject more interesting and easy to understand. Tata Centre for Technology and Design (TCTD), IIT Bombay, under the domain of ‘Education’ is working on a compendium of board and card games to make the teaching-learning process for Chemistry meaningful, well connected, and fascinating. The objective is not to replace the traditional teaching pedagogy but to complement it. The present focus is on standards VII and VIII where chemistry is introduced. 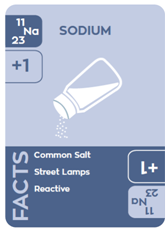 A part of this compendium is a card game CHEMPLAY which addresses two important aspects of chemistry viz. : introduction to first twenty elements and formation of simple compounds.